According to the latest NPD figures, the PS4 was the biggest selling console in the US last month, but the Xbox One was the faster selling one. 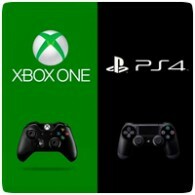 We already know that the PS4 managed to sell over one million units in the first 24 hours, while the Xbox One managed to sell approximately 101k every day. It wasn’t revealed how many units the PS4 sold exactly in November, however. The PS4 also sold more next generation software than other platforms last month, and had a much higher initial attach rate than PS3 or even PS2.